A Rival to the Project Management Book of Knowledge (PMBOK)? 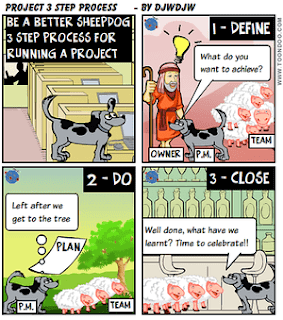 The two year project to brain dump my thoughts on improving Project Success is near a close with some hopefully informative posts accompanied by cartoons and proverbs to occasionally amuse you. I therefore want to commend this Blog to you as a reference site to use in future as you manage your Projects especially if you are fairly new to the role. This is covered in more detail here but in brief you can click on the Tags button in the right hand margin and select a topic label or I find Search at the top of each page works well. So if you are doing some planning and want to look at guidance, either look for the topic label or enter the word "planning" in search. how am I going to get the plan back on track? how am I going to address this difficult stakeholder? Therefore the Examination will be in the form of a Crossword puzzle and can be found here. 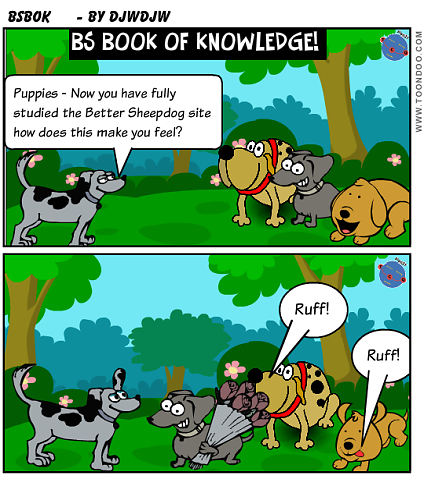 Anyone who emails bettersheepdog@gmail.com with the correct answers will go on the site honour board, good luck! Lastly, I want to thank my colleague Manoj for encouraging me to commence this Blog back in 2014 and to all of my followers for reading & commenting on the posts during the last two years. Good morning! At the beginning let me say that I appreciate you sharing your knowledge and experience. I really like reading your articles!. I understand you perfectly because I have to deal with ad agency project management software.